Also remember our guide to constructing a runner deck as we go through the details. 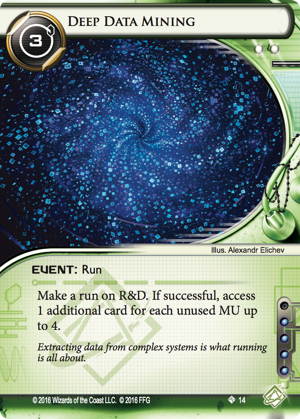 The idea behind this deck came when I realized the potential of Deep Data Mining (DDM) as an incredible card. Fully loaded you can access 5 cards out of RnD, so it’s almost like an Indexing without needing to run a second time. So how does one free up memory? First, we use Dhegdheer, which is obviously good. Second, we use Adept because it synchronizes with the gameplan. I’ve not tried this deck with Savant instead, but I will probably give it a try at some point to see if it’s better. I suspect it might be, but then I’d probably want to import 2 copies of Paperclip, which costs 6 influence, so I’m not sure if it’s worth it. With Corroder, perhaps. Third, we grab a console that provides 2 MU, only costs one influence, and has an amazing ability. I love The Gauntlet. Ideally, between Adept, Gordian Blade, and Magnum Opus, I want to have 2 installed on Dhedheer in order to get the full benefit from DDM. With the help of Ayla’s NVRAM and Self-Modifying Code, I can usually make that happen by turn 6 or 7, which isn’t bad for Shaper, which is generally the slowest of the three runner factions. So we have a rig gameplan and a way to get money throughout the late game with Magnum Opus. But it’s still a fairly slow deck and I want to be able to pressure as soon as possible. So I include three copies of Diesel and three copies of Quality Time in order to find the pieces I want. Also, because this is Shaper and I want to include all sorts of nice tech, being able to find the tech when I need it is key. I went back and forth between Quality Time and Earthrise Hotel, but settled on the former because it’s a bit cheaper and because I have enough redundancy in the deck that I usually don’t need to keep every card. Plus it synchronizes with Modded. That, along with good ol’ Sure Gamble, round out the non-MOpus economy, so finding MOpus early is very crucial. The rest is tech. Beth-Kilrang Chang is an amazing utility card and I try to find a spot for one or two copies in any Shaper deck I make. Vamp is an amazing card whenever you have MOpus because it can stop the corp dead in their tracks. Same Old Thing for those occasions when I want to pull back a DDM or Vamp. I guess those count as tech cards, though I view them mostly as utility cards. Every one of those decks except Prison has the ability to score quickly and/or fast advance. So very early on I determined that I needed to include Clot to slow these decks down. Then, after playing a couple of games against CI7, I realized that I also needed to protect that Clot. I didn’t want to use influence on Clone Chip, so I added Sacrificial Construct, which ends up being clutch against Skorpios and sometimes SYNC as well. Of those decks, only SYNC aims to kill with meat damage, but I like to be careful regardless and almost always pack a Plascrete Carapace. Employee Strike is almost a must-include right now in any runner deck, because it helps tremendously against AgInfusion, Skorpios, CI, and IG. I would never get rid of the two copies and would even consider a third. My third current is Rumor Mill, which I put in because it helps a lot against Jinteki decks that are using Caprice Nisei, which seem to give me the most trouble out of anything. It’s a lot of influence but there’s not really any cards that I’d rather spend influence on. Councilman is incredibly good against CI7 and helps protect against Caprice as well. Film Critic is extremely good in many matchups. It helps get key Jinteki agendas, it helps protect against any deck running Midseason Replacements, and it’s so important against Skorpios to block Hunter Seeker. I’ve even considered putting in 2 copies. After a lot of testing, I think I will stick with this set of tech cards until the meta changes and forces my hand. Because Shaper is so versatile and because I can put in so much tech, I have decent matchups almost across the board. The downside, though, is that I do have to fight hard to get nearly every win. But this suits my playstyle well and I think I’m going to stick with it. I brought this deck (with a couple of tech cards swapped) to the New Hampshire Regionals and managed to go 3-1 with it, which I was proud of. While I generally like my homemade decks, I typically don’t do so well with them in a competitive setting. Round 1 was against a Foodcoats-style HB deck and I had more or less the perfect hand and perfect NVRAM. I was completely set up by turn 5, I believe, and was able to ignore his remote servers and just go for centrals. 1 Deep Data Mine and a couple of timely Gauntlet runs on HQ and I have enough agendas. I definitely got lucky here but I think this is an excellent matchup for me anyway. Even though some very good HB ice I can keep up enough money to both pressure centrals and snipe the remotes. Round 2 was against a very standard Jinteki RP deck, and my luck ran out entirely. I had a very slow start, and when I tried to run a remote with a single-advanced agenda on it, the other player rezzed Ichi 1 and Marcus Batty. I lost the psi game, and because I only had one click remaining, I lost both the Adept and MOpus. There was no recovering from that and the game was over quickly. Round 3 was again against HB, but with a more speedy strategy than the round 1 deck. I had a decent start and started pressuring centrals with money to spare. My opponent was a bit flooded and I managed to get 2 agendas from a DDM dig and 2 from The Gauntlet. The final round I played my friend and podcast contributor Orion, who was playing the Skorpios deck I linked to above. This was a tricky matchup for me, not only because Skorpios can be tough to play against, but because Orion and I know each other’s decks almost down to the card. I am careful to slowly build but keep my money up because I have no protection against Hatchet Job. Orion pulls out his secret tech I didn’t know about: Underway Rennovation which he uses to get rid of some cards that would have been nice to have. Critically, on his fifth and final advancement he sees both Employee Strike and DDM and decides to exile Employee Strike. I have a Same Old Thing already on the table and I am able to quickly get Adept out with enough money to dig and take some points. Later I am able to play a second DDM, but Orion advances an Ice Wall to enough strength to surpass the power of Adept. Sadly I had already trashed both Dean Listers. So the rest of the game is me running constantly on HQ and slowly getting enough points to win. I did not do as well as I’d hope on the Corp side but I think this deck performed well. I’m hoping the meta remains somewhat friendly to it so I can continue to play it at the next Regionals. But I’ll keep testing and playing to hone my play even further. Please let me know if you found this write up helpful. 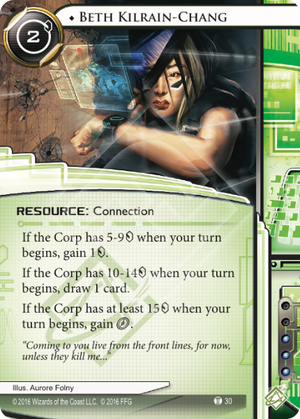 I don’t want to post too much Netrunner information here, since this is a site about board games generally, but I had a good response to Netrunner Week and the Netrunner podcast so I think there are some other fans out there! I would suggest dropping 3x Diesel and 3x QT and using 3x Laguna Velasco District instead. 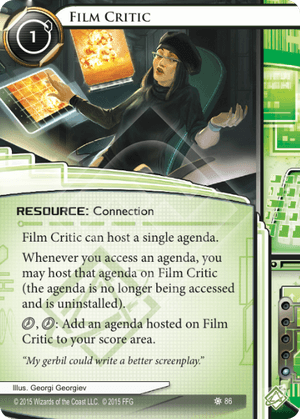 That frees up 3 card slots for another Film Critic and 2x Mad Dash (which combos very nicely with both DDM and Indexing). Speaking of which, 2x DDM is probably enough, which opens up a slot for an Indexing (which is always good even when DDM is your main plan). That’s an interesting suggestion, although in my gut I feel like Laguna is sort of anti-synchronous with MOpus since it’s less efficient per-click than Diesel/QT and I want to be clicking MOpus a lot. I’d rather have DDM than Indexing, for sure, because it’s almost strictly better unless I’m worried about net damage (doesn’t require 2 runs, doesn’t get thwarted by Jackson/Moon). And with no Indexing, there’s no reason to have Mad Dash. Did you mean Freedom Through Equality? I think I’ll try out Laguna, though. FtE is great, but you already have 3 currents you want to use, so it’s suboptimal here. Mad Dash gives you the same ability to win on 3 scores without getting in the way of EStrike/Rumor Mill. As for Laguna, it’s blazingly fast. With Beth up and running, you can draw 10 cards a turn to find what you need. Tempo needs change as the game progresses, though; you won’t need Laguna much when you really want to crank on MOpus because you’ll have your stuff.